Sean: your project sounds like a simple one. Any HVAC contractor can do it (no special skills required). 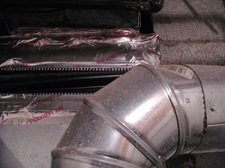 In fact, if your duct is standard size, you could probably do it yourself by going to Lowes and picking the elbows and runs needed to divert the duct. In re-routing it, you could lose some efficiency, but nothing to be nervous about (the more turns, thel ess the air flow). Good luck with your project. Also, if it happens to be a return (intake) rather than supply, you will lose nothing in terms of efficiency. Check the air flow. Call Tony Atanasio. at Atanasio HVAC. They're a family business, honest with excellent advice and work. I've gone through about a dozen HVAC companies. Most of the big names are terrible. For the past 3 years I've been using J & R Plumbing and Heating for my personal residence and a couple of apartments. Jim and his son actually know what they are doing. A rarity in the business. You can reach them at (518) 869-0363. And tell Jim that Perry sent you.